Sweeping in an immense arc across South Asia is the â€œRoof-of-the-World,â€ the Great Himalayan Range. Beginning with Kashmir’s 26,600 foot Naga Parbat and ending at Tibet’s 25,445 foot Namcha Barwa, it comprises an uninterrupted 1,500 mile long crescent of mountains with over 110 peaks rising to elevations of 25,000 feet or more. For thousands of years, the largely inaccessible inner portion of that vast wilderness has inspired countless myths and legends of a hidden society of great masters possessed of supreme wisdom and power. Absent an ember, there can be no smoke; there is a kernel of truth in all such ancient and enduring legends, and they cannot be easily, or wisely, dismissed. Years ago, in a secluded part of that inner range, explorer Hawking chanced upon a valley nestled deep in the rugged wilderness. In that isolated valley he encountered a small village called Siddhalaya. Ancient and profoundly beautiful, Siddhalaya is set in a valley encircled by Himalayan ice peaks so high as to appear overhead and surrounded by vast snowfields rolling upward from evergreen forest to immense blue-white glaciers. Hawking’s discovery marked the beginning of a series of remarkable adventures and experiences. Soon after arriving he realized, a bit like Columbus or Marco Polo, that he had discovered a world far stranger and vastly more profound than he had ever expected or imagined. Hawking spent over five years in Siddhalaya, where he had the privilege of meeting a number of extraordinary men and womenâ€”introduced to him as â€œmastersâ€ and â€œadeptsâ€â€”possessed of knowledge and power virtually unknown to the Western world. In this book, you will meet these remarkable people. 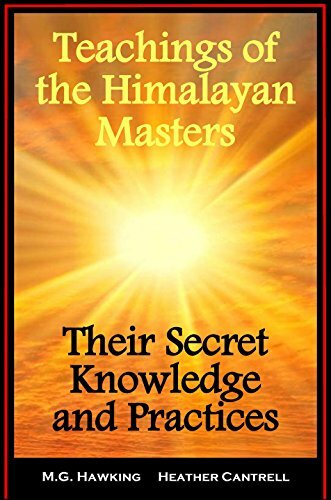 Drawn from the extensive journals and field notes he kept of his experiences and conversations with the masters, this book reveals the rare esoteric knowledge and practices of those profoundly enlightened Himalayan adepts. Richly enlightening and deeply inspirational, this volume sets forth the fundamental knowledge, essential principals of consciousness, and visualization practices to manifest astonishing creative powers. A must read for anyone seeking greater personal knowledge and power. Organized topically to be easily utilized as a study guide, in this book you’ll learn directly from dialogues with true masters how to use your own creative power in every aspect of your lifeâ€”wealth, health, relationships, love, happiness, and in every interaction you have in the world. If studied with care and practiced with intent, you will be enabled to recognize and utilize the hidden, untapped power within you. An unprecedented and extraordinary account that is inspirational, thought provoking, and richly entertaining, this narrative will resonate in your heart and mind long after the last words have been read. 2015 Release, 67,230 words, Kindle Edition Normalized Page Count 362. BONUS SECTION includes excerpts from In The Valley of Supreme Masters, The Greatest Knowledge of the Ages book series.